Trichocereus candicans is a species from the genus Trichocereus that originally grows in Argentina. First of all, this species is a mess. There are totally different types of plants floating around in the collection and I am not even counting the hybrids yet. There were numerous taxonomists in the past 100 years messing around with Trichocereus candicans and I am not really happy with the current taxonomy either. There originally were a couple of different subspecies like Trichocereus candicans & Trichocereus pseudocandicans + the closely related species Trichocereus lamprochlorus + neolamprochlorus. Trichocereus lamprochlorus was once again divided from Trichocereus candicans…and for good reasons. Trichocereus candicans is a small and compact columnar cactus that builds clusters and grows approximately 75 centimeters tall- The plant usually has a yellowish skin color and grows in clusters up to 3 meters wide. The columns are 8-15 Centimeters thick and have between 9 and 11 Ribs. Areoles are pretty big and white felted and up to 2 centimeters apart of each other. Trichocereus candicans has 10-12 Radial Spines that are up to 4 centimeters long and 4 middle spines that are up to 8 centimeters long. 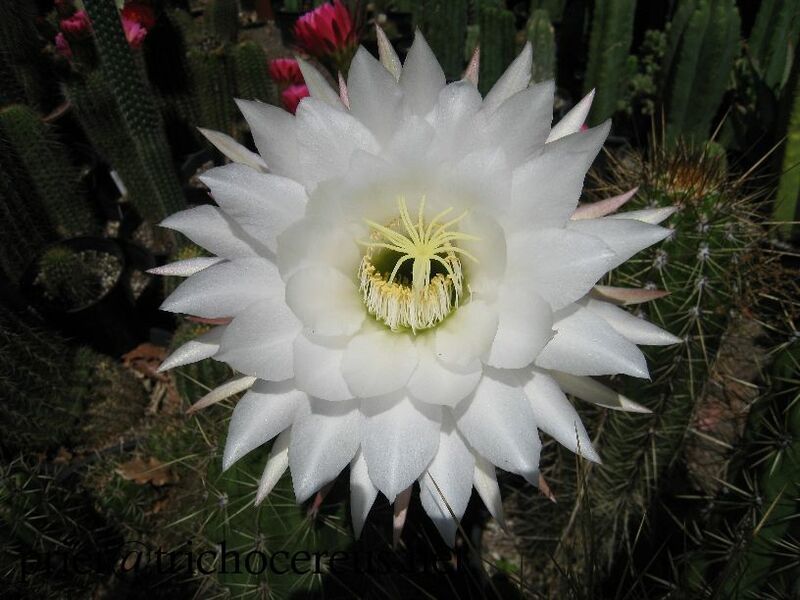 Flower: Most specimens of Trichocereus candicans have white flowers, but this is a heavily bastardized species in nature and I´ve seen various populations that had all kinds of flower colors and everyone of them was more beautiful as the other. And they had all kinds of flowers…yellow, red, white, you name it! Regularly, the flower is white and reaches a size of up to 20 centimeters (and some forms or varieties even more). The flowers have a very nice smell and attract all kinds of insects. Because of its excellent flower, Trichocereus Candicans is a perfect plant for hybrid breeding. The flower looks amazing and accepts pollen of most other Trichocereus, including the San Pedro cacti. Because of that, it´s a great candidate to breed colored flowers into the whole San Pedro group. Trichocereus candicans is Night flowering. Besides, it is self-sterile, what means that you need pollen from another donor to produce seeds. Origin: Argentina. Around Mendoza and Cordoba. San Juan, Catamarca, La Rioja. Just like I already mentioned, the species is very variable and is also close to Trichocereus lamprochlorus. 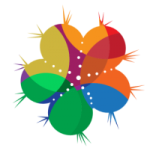 There are intermediates that show traits of both species and it´s nearly impossible to give a definite ID. There are natural hybrids between Trichocereus candicans x Trichocereus huascha and Trichocereus candicans x Trichocereus strigosa. CITES: Trichocereus candicans is in Cites APPENDIX II. 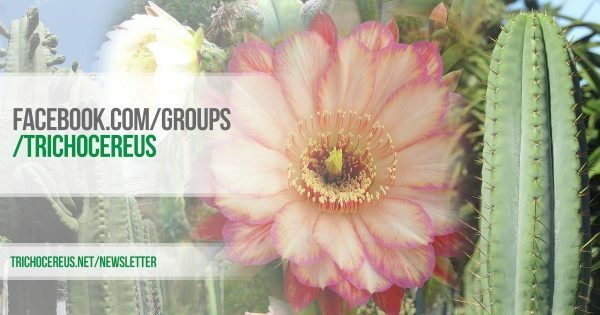 Varieties & Cultivars: Trichocereus candicans var. gladiatus (with very large flowers), Trichocereus candicans var. robustior, Trichocereus candicans var. rubriflorus, Trichocereus candicans Gröner Hybrids (which is a hybrid between T. candicans x Pseudolobivia, which flowers very early on), Trichocereus candicans var. tenuispinus, Cantora hybrids (which is a cross between Trichocereus candicans and Echinopsis toralapana), and so on. Trichocereus candicans is a very good species for grafting or hybrid culture. There are certain hybrids with extremely beautiful flowers called CANTORA. 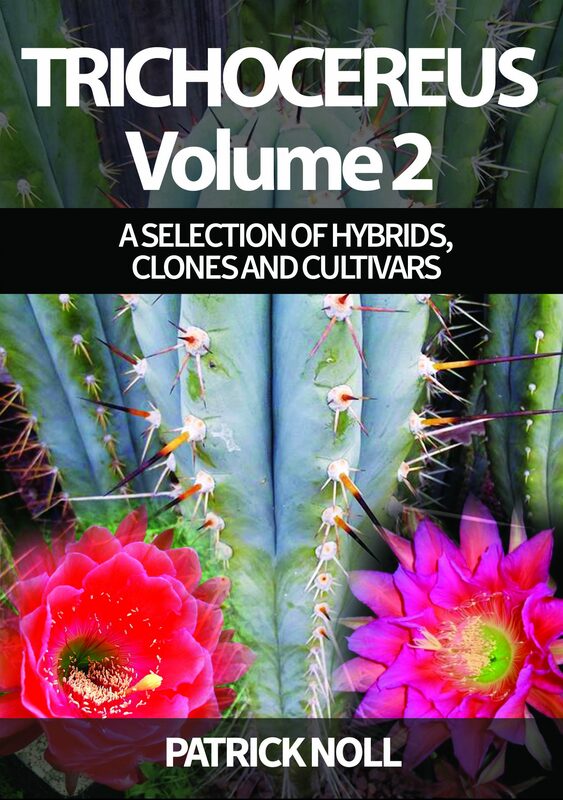 Those hybrids are one part Trichocereus candicans and one part Echinopsis toralapana. Many taxonomists would agree that this species an extremely variable plant that makes many problems. 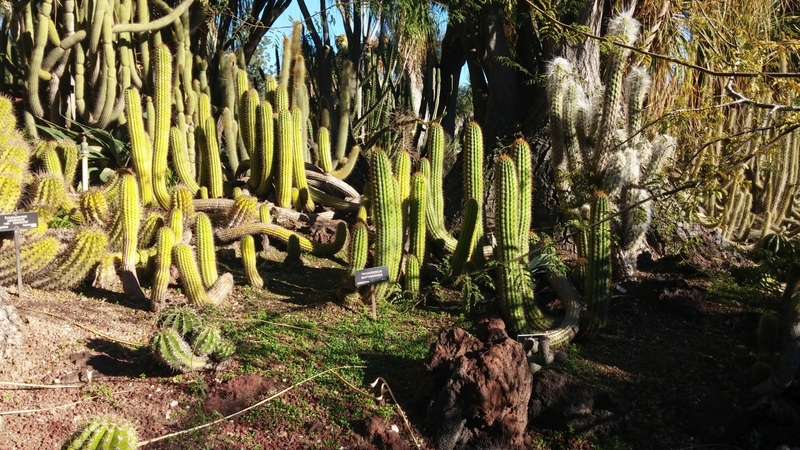 And while I agree with that, it´s also caused by the chaos that was caused by the large amount of different types that were all merged into this huge species “Trichocereus candicans”. Because there are so many different types available on the market, there are countless atypical plants that grow more columnar than standard Candicans´or that have very short spines instead of the long spines that most candicans are known for. 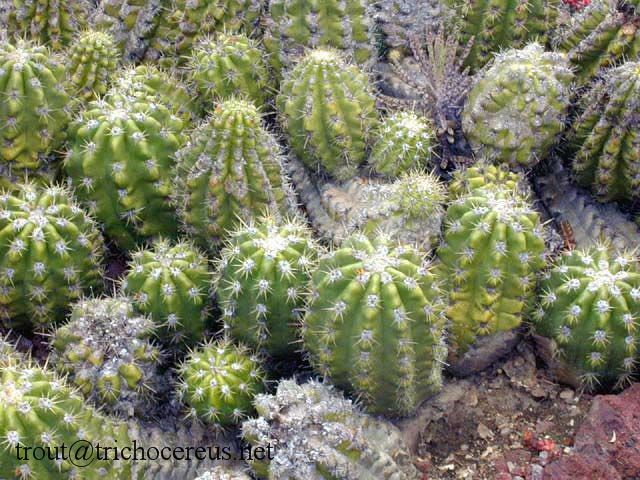 Cultivation: Trichocereus candicans is very easy in cultivation. It is an excellent grafting stock that is known for its great frost tolerance, but the plant is so beautiful that you can also grow it just because it looks cool. Especially the colored flower hybrids around La Rioja are amazing and I can only recommend you this amazing cactus. The plant takes many years until it flowers but there are some hybrids called Groener candicans that are basically the result of an open pollination between candicans and Pseudolobivia, which flower very early on within the first five years. Those hybrids were named after the grower who raised and distributed them. If you can get those hybrids, you wont regret it. But they are rare and should only be watered when it´s hot. Because of that, the plant does not get any water in between October and April. In Europe, you can overwinter them in a bright place with lots of fresh air at a temperature of approximately 10° Celsius. That´s the minimum average temperature and they do not need any water until the temperatures are starting to rise again. Cultivation from Seed: Trichocereus Candicans is very easy from seed and requires the same treatment as any other Trichocereus. They are really frost resistant and can sometimes withstand short night frosts of down to -8° Celsius/17.5° Fahrenheit. I would not want to test it out though, because it always depends on the general health of a plant. The minimum average temperature is around 10° Celsius/50° Fahrenheit. The seeds will start germinating at temperatures between 24-30° celsius and require very little water to germinate. They are relatively uncomplicated to grow but I had the best experiences with a soil that was purely mineral. Propagation: The plant is propagated by live Cuttings and seed. Seed & live cutting sources: I am working on getting this species in my shop. As soon as I get high quality seeds of this one, I will let you know. Trichocereus candicans var. 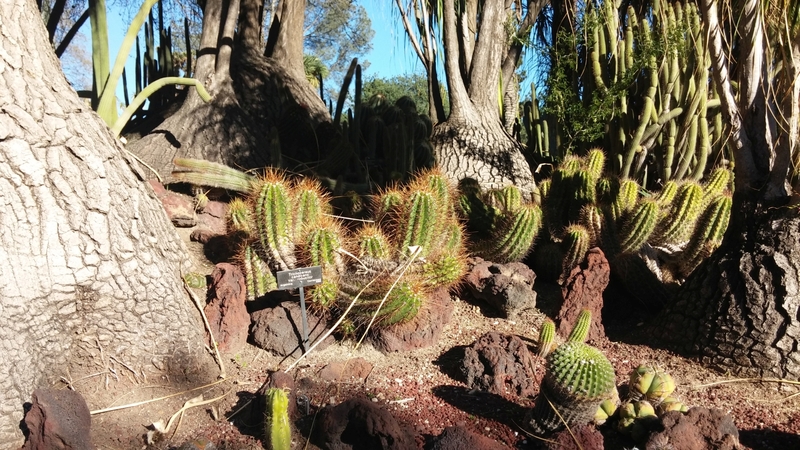 robustior on the left and the very rare Trichocereus santiaguensis on the right! On this beautiful specimen you can see how similar Trichocereus candicans can get to Trichocereus taquimbalensis. However, Trichocereus candicans tends to have a higher spine count and a different spination. 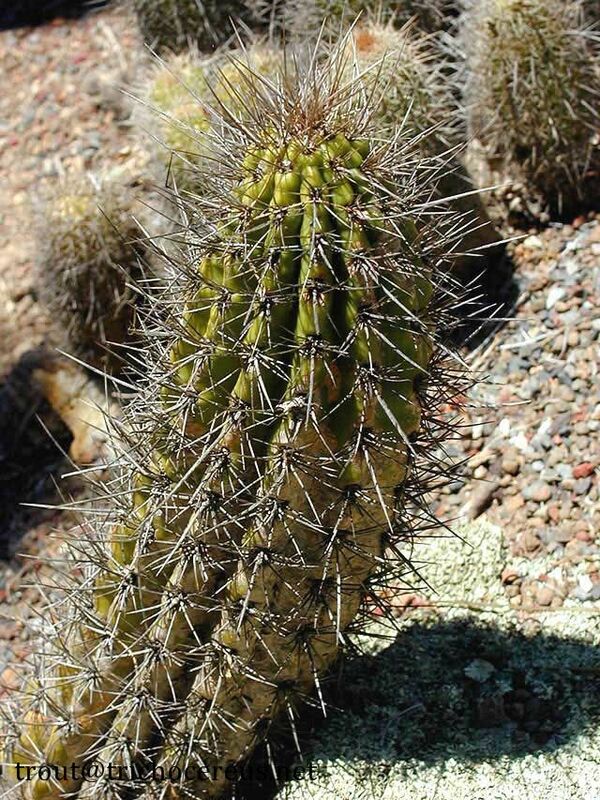 The spines on Trichocereus taquimbalensis are crooked and look very different. 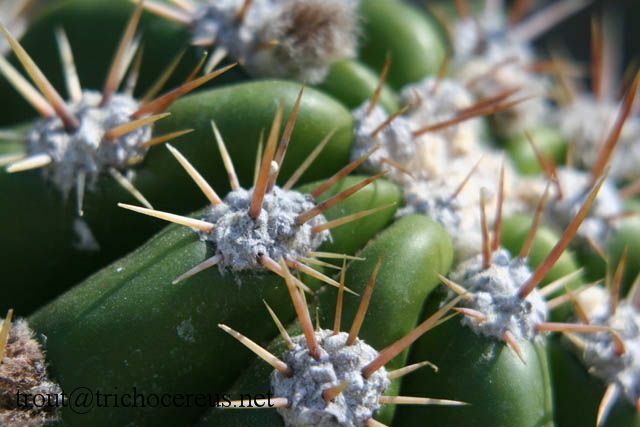 The epidermis of both Trichocereus candicans and Trichocereus taquimbalensis are waxy green. There are forms of both that are not waxy and that makes identification difficult at times. Trichocereus candicans does not get as tall as Trichocereus taquimbalensis and if you see them forming lower colonies instead of columnar cacti, the plant is probably a Trichocereus candicans. This form is also similar to what was described as Trichocereus gladiatus.